Professional Clock Repairs and Servicing. At Mobile Clock Repairs we offer professional clock repairs and servicing of all types of clocks – of all makes and sizes. 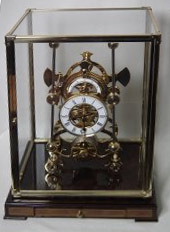 With over 30 years experience, we specialise in antique clock repairs and are trusted by a number of High St jewellers in Yorkshire to undertake repairs for their customers. So whether it’s an old grandfather clock, an antique piece or a small chiming clock that requires restoration, you can rely on our expertise and quality of service to get your clock up and running again. I offer home visits to all of my customers to save you the trouble of bringing your clock to me. If you are in need of any of these services, please get in touch today on 01423 888434 or 07984 876 874. If you prefer to email please use tonyhare@aol.com.